Please welcome today's paranormal guest author Nell Stark! Nell is the author of Running with the Wind and Homecoming and is co-author of the Everafter series which includes Everafter, Nevermore, and Nightrise. Nell: I began writing as soon as I was literate. I honestly don't remember a time when I wasn't composing stories: first by hand on lined paper, then on my family's clunky Apple IIE, and later on more sophisticated computers. Everywhere I went as a child I saw stories, and I always wanted to write them down. At age 16 I finished my first novel, which turned out to be an earnest but really quite awful "epic" fantasy story, the protagonist of which was my idealized self. During my college years, I began to refine my skills in earnest through coursework and workshops. Later, as a doctoral graduate student, my first manuscript (a traditional romance) was accepted by Bold Strokes Books. I met my partner and everafter collaborator, Trinity Tam, through my publisher. Trin and I began work on the everafter series late in 2008. Nell: I came to paranormals via fantasy, which I discovered at age 8 when my mother handed me a copy of Tolkien's Lord of the Rings. She wasn't sure I was ready for Middle Earth, but I quickly became hooked. After years of reading fantasy, I branched out into urban fantasy and paranormals. I've enjoyed writing the everafter series because creating paranormal characters is an intriguing way to explore the human condition. Vampires and were-creatures are in many ways "more human than human," in that they are compelled to surrender to their animal appetites. Vampires thirst for the very essence of life, while Weres don't just act like animals--they become them. Nell: If I were asked to choose between life as a vampire or as a were-creature, I'd choose the latter. I would not want to miss out on having the chance to experience the world through animal-caliber senses! However, if I could have any supernatural ability, I'd choose the ability to heal. 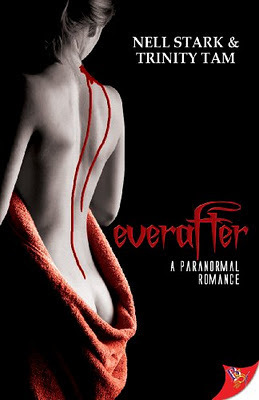 Nell: As a paranormal romantic thriller, everafter combines the best features of three genres. It features a lesbian romance between paranormal characters as well as an action-adventure plot set in contemporary New York City. Its two sequels, nevermore and nightrise, introduce additional challenges for the central couple and also allow readers deeper access into the underground society of vampires and wereshifters. Nell: I love this question! If everafter were made into a film and I could call the casting shots, Valentine Darrow would be played by Katee Sackoff, and Alexa Newland would be played by Rachel McAdams. Thank you Nell for joining us here today at From the Shadows! To learn more about Nell Stark and her books, please visit her website. We are giving away three copies of Everafter by Nell Stark and Trinity Tam! To enter, please leave a comment on this post including your email address (so we may contact you if you win). You do not have to be a follower to enter (though I always appreciate a follow!). This giveaway is international. US winners will have their choice of ebook or paperback. International winners will receive an ebook copy. Giveaway ends November 5th midnight EST. Thank you for having this giveaway. The books looks fantastic. Another great interview. Great cover I'd love it. Thanks. The cover is awesome. Thanks for the giveaway! Best vampire/were series ever. Can't wait till the next book. Thanks for the giveaway. This looks like an awesome book , the cover looks great too. I'm so looking forward to reading this book. Love all you authors! This book looks so good I haven't read a really good LGBT book in a long time and this definitely has caught my eye with its cover and story line. Love the cover and definitely want to start reading this series. This cover is so great. I love the blood coming down. It's eerie. Thanks for the chance to win! The book is only $0.99 on Kindle and Nook, so even if you don't win, you can read it for cheap! The sequel is $3.99. Thanks for the giveaway! Great interview and I can't wait to read it. Thanks for the giveaway! The book seems interesting to read! i like it that it is a lesbian paranormal romance. it's something new for me and i would love to read it. the cover is beautiful. I love the cover, it is gorgeous. Thank you for the giveaway! This looks like a great read and I am always looking to try new authors. wow, looks great. I'd love a chance to read. This sounds like a good book, thanks for hosting the giveaway!! Thanks for this giveaway! The book sounds really good and the cover is amazing! Thank you for the interview and giveaway! :) I'd love to read it.